BOSCH is returning for its ten-episode fifth season on Friday, April 19, Prime Video announced. BOSCH will return for a sixth season, Amazon announced. The drama, which is based on the Michael Connelly book series, is currently in the midst of filming its fifth season. (Season 4 bowed in April; Season 5 will debut in 2019.) BOSCH—which is Prime Video’s longest-running series—stars Titus Welliver, Jamie Hector, Amy Aquino, Madison Lintz, and Lance Reddick. 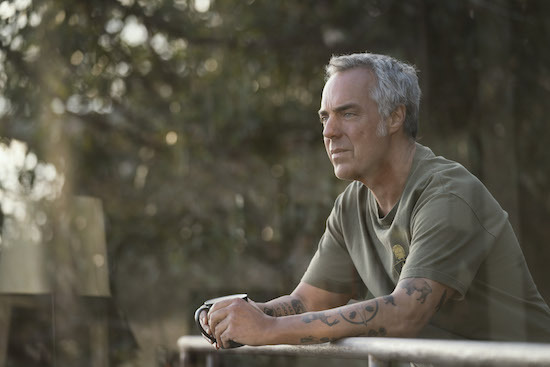 When season 3 wrapped up, Bosch (Titus Welliver) was convinced that he had finally found his mother’s killer: Walker (John Getz), the head of the police commission. But when season 4 kicks off, Bosch will have other pressing issues on his plate. Amazon is expanding its original series slate, and one of the next dramas on tap is BOSCH, set to bow in 2015. Check out the newest trailer now!